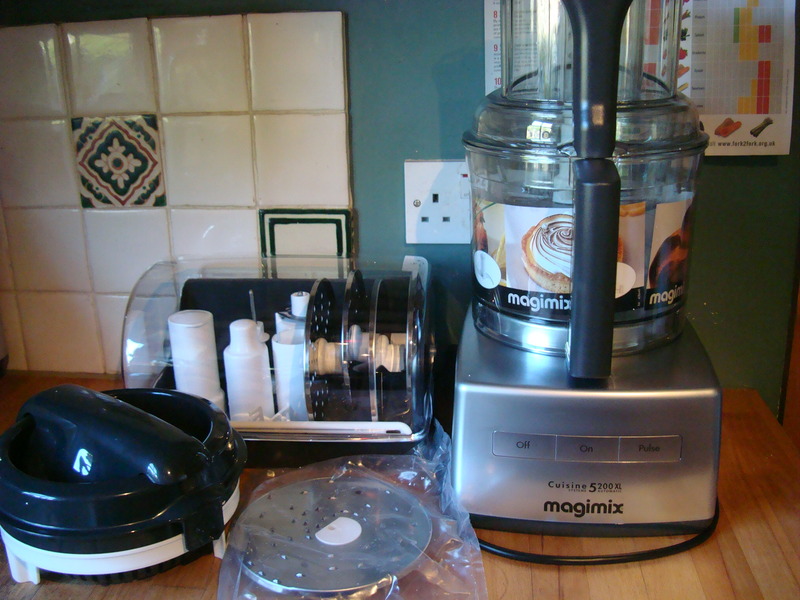 My new obsession borders on love actually, and my brand new girly power tool, a lovely new Magimix 5200XL food processor, is the object of that love. From the moment it arrived, as I ripped open the packaging to see its sleek, shiny, good-looking body, I was in awe. It looked good in and out of its packaging, but at the same time its strong, sturdy and practical design (like the perfect man perhaps? the perfect combo of substance and style) suggested it would stand the test of time. Yep, you got it, I’ve fallen for it big time! 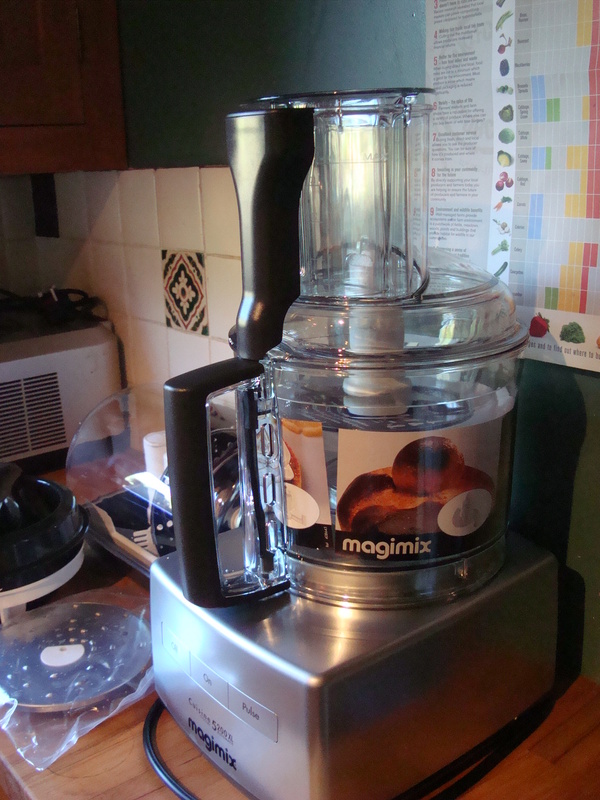 For years I’ve wanted a Magimix. I’ve stared in desolation at images online longingly desiring that unattainable bit of eye candy for the kitchen. I’ve seen other serious cooks use them and tried them out myself. It made me want one even more. Now that I actually have my own I’m like a giggly, nervous teenager experiencing my first crush. Of course like every new relationship it has to be tried and tested, and this weekend I certainly put through its paces. I’ve grated, shredded, blended and pulsed. Since it is an extra-large model, designed for catering as well as household use, it has three bowls in one, all of differing sizes. I’ve tried out each. The smallest is perfect for smaller quantities of blended sauce or puree. I made a sauce verde with parsley, coriander, mint, a squeeze of lemon juice, some salt and some olive oil. I only needed enough to marinade my chicken for the barbecue and the machine managed it admirably. “Woah, has it done it?” she said, not quite believing how quick it was. For its next test I let the teen have a go. Smoothies are her favourite. I’m sure she would live on them given half a chance, but as my smoothie machine blew up a while ago (after she used it I might add) she’s been sadly deprived and longing for an adequate replacement. This was the perfect opportunity to see how it fared. We threw some mango, strawberries, banana and a handful of frozen blackcurrant’s in to the largest bowl along with a splash of semi-skimmed milk and some apple juice. If you like it sweeter you can also add a trickle of agave syrup or honey. I clicked the lid in to place (even doing this feels smooth and efficient) and the machine switched on. 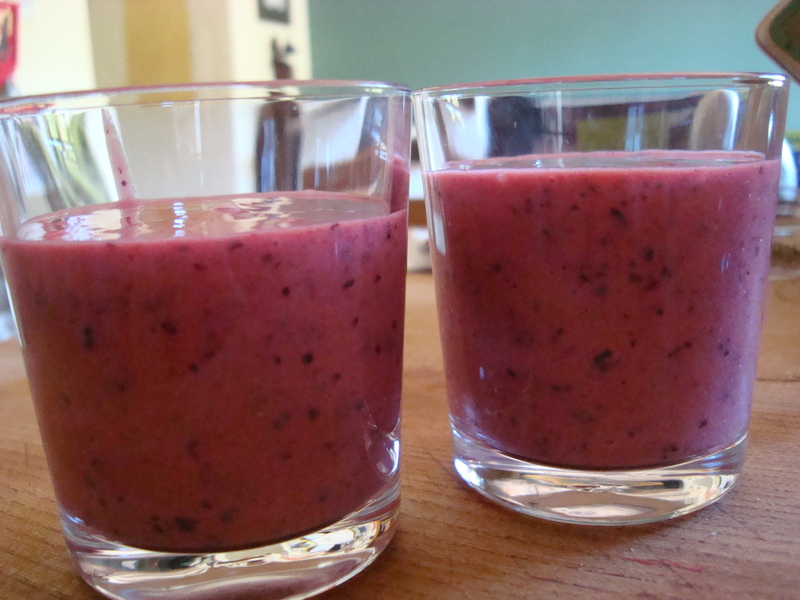 Less than two minutes later we had four glasses of perfectly smooth, thick smoothie. For our last test of the weekend I decided to experiment. With another wedding coming up, for which I need to cater for half a dozen vegans, I thought I’d have a go making a vegan chocolate mousse cake. I’d recently been sent a couple of blocks of Willie’s Cacao (made by Willie Harcourt-Cooze) and thought it the perfect opportunity to try it out. Willie’s cacao is a serious cooks chocolate and not for the faint hearted. Its strong, pure cacao, quite expensive, but I love it and its worth it. Plus it sounds like you are buying something elicit with names like Madagascan Black and Venezuelan Black!! It’s not a chocolate you can eat straight from the wrapper so don’t even try! Its sharp and bitter because it has no added sugar or sweeter like other chocolate and although the hint of fruitiness is still in evidence, it’s strictly for adding to dishes. I found a recipe on Vegan.com that I tinkered with to create something that suited our palate. 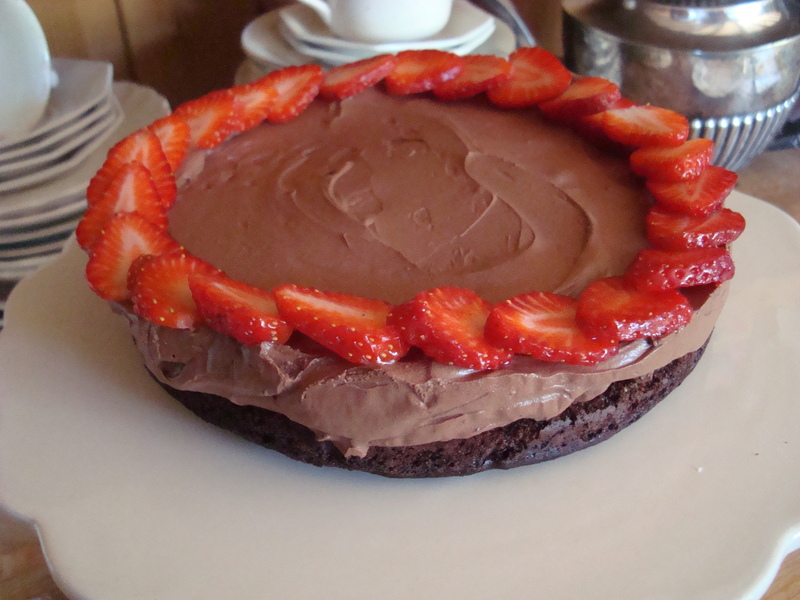 It consisted of a thin cake layer topped with a chocolate mousse, plus a layer of fresh fruit. 3 tablespoons sunflower or ground nut oil. Mix all the dry ingredients in a large bowl. Make a well in the centre then add oil, vanilla and cider vinegar. 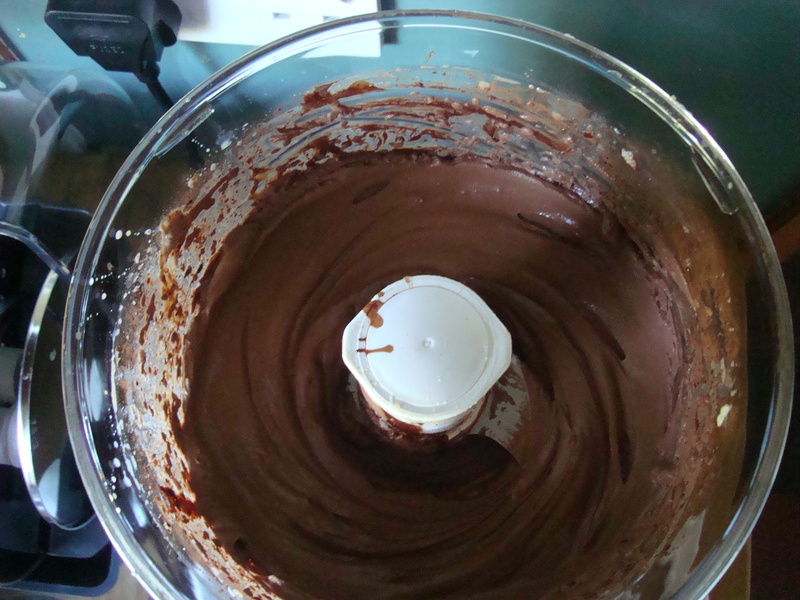 Stirring lightly with a fork, add enough cold water to make your cake batter. 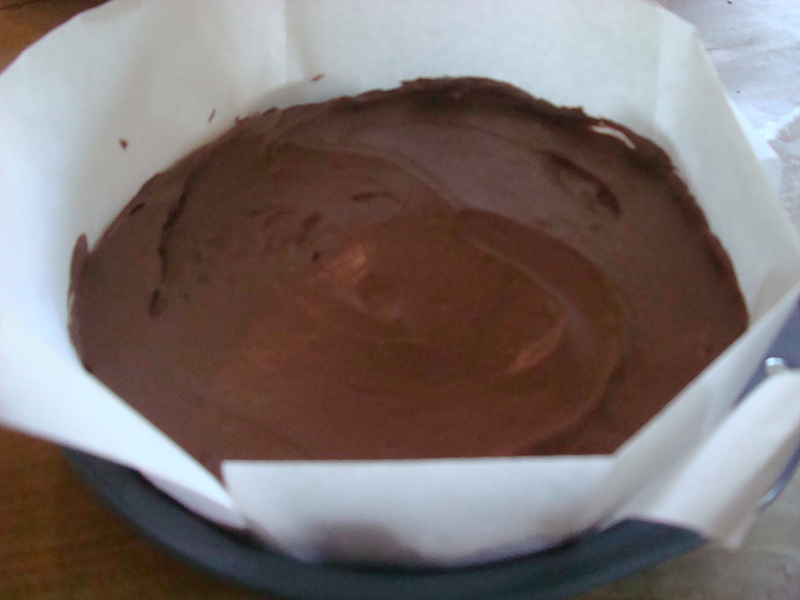 Turn into an oiled and lined 7 inch loose bottom cake tin. Bake in a preheated oven gas mark 4, 180 degree C for around half an hour. Keep checking after 25 minutes. In a the large bowl of the new food processor in placed 1 block (about 300g) silken tofu, 1 teaspoon cocoa powder, 1 teaspoon vanilla essence, a pinch of sea-salt, 2 tablespoons vegan milk (soy milk) which I blitzed for a couple of minutes. To this I added 1 block of Willie’s cacao (I used the Madagascan Black) which I had melted in an oven proof bowl on the lowest shelf of the preheating oven and between 1 and 4 tablespoons (or as much as you need) Agave syrup. The texture was fantastic. Mousse like, smooth and creamy. My old processor would never have managed to blend the tofu so effectively so I was over the moon with this. The mixture was then smoothed over the cooked and cooled cake base which was then placed in the fridge for a couple of hours. Finally I removed the mousse cake from the tin and decorated it with sliced strawberries. The verdict? Well, apart from the base being a little firm, it was a great hit!. The mousse itself was light and creamy with enough dark chocolate taste to satisfy the hard-core chocolate lover. Hubby was less impressed. He’s not that keen on very dark chocolate, but then he doesn’t have much of a sweet tooth anyway. Teen loved it, as did the kid. Sadly we didn’t find any vegans to help us out, but it would never have lasted that long anyway. So a weekend of success? Yes very definitely. I would recommend a Magimix to anyone. Perhaps not such a large model for the average kitchen, but they do lots of smaller models in gorgeous funky colours. Is my affair going to last? Well so far so good….but I will let you know after I’ve made hummus and salad to feed 500 next weekend!! Have you grated carrots or cheese in the magimix yet? I’m interested in getting one. Carrots do brilliantly. I’ve probably grated about 10 kilos so far!! I like to do them on the chunkier disc (beetroot does nicely too). Cheese I haven’t tried yet but so far everyhting else has grated well so I don’t see why cheese wouldn’t. The only attachement that disappointed was the egg beater. I was hoping for fluffy egg white but it didn’t work that well. 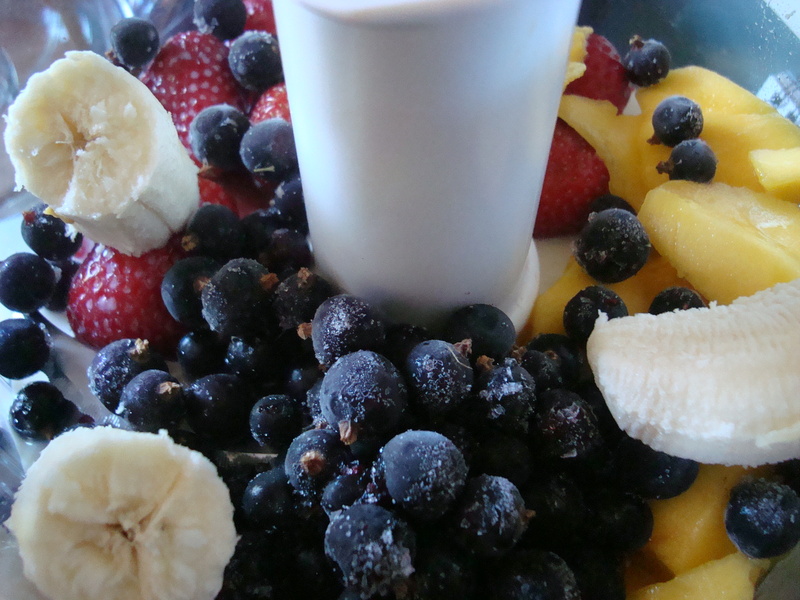 Do you have any other tips for using this for smoothies? I added some frozen spinach to a smoothie and my magimix didn’t really do a good job of pulverising it so the resulting smoothie wasn’t exactly smooth!